Temporary urbanism, pop-up culture and sustainable architecture often meet in the re-use of shipping containers for everything from restaurants, offices, retail outlets and even one Starbucks location. San Francisco's Octavia Street is veritable gallery of re-use prototypes, with a beer garden, coffee shop, gourmet ice-cream store and a boutique menswear store all housed in various configurations of shipping containers. Shipping containers are a popular 'green' architecture material because they are durable, easy to come by, and represent an enormous embodied energy. 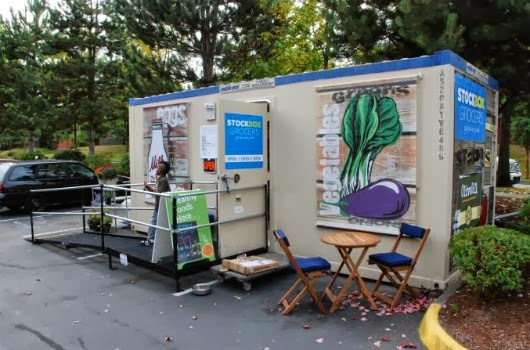 One start-up has found a use for shipping containers that addresses food deserts, providing access to healthy, organic, and often local, produce in Seattle neighborhoods that lack other grocery store options. (The USDA estimates that more than 23 million Americans live in food deserts.) 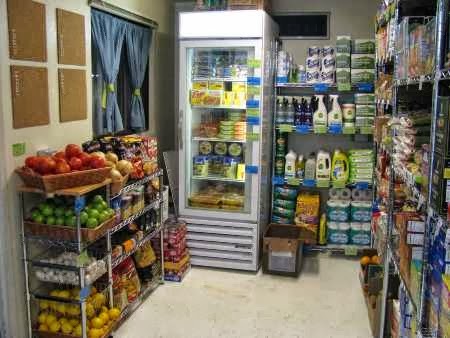 Stockbox Neighborhood Grocery was the brainchild of two MBA students who envisioned small, low-cost stores housed in shipping containers located in parking lots. The stores would stock the most common, high-turnover items, and rely on customers to help decide what should be stocked. 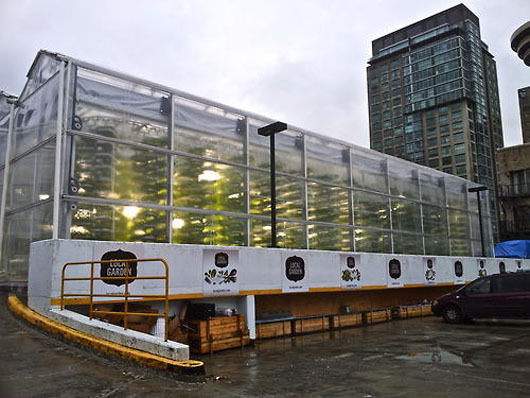 The use of containers created a low-startup cost compared to brick-and-mortar, and the small size of the stores would mean low overhead and operating expenses. The small size and technically temporary nature of the store's design also allows for quick implementation, avoiding lengthy code and design reviews. The two initial stores have been so popular that they quickly outgrew the shipping containers and expanded into permanent structures, but the company has plans to continue to expand the container stores in the Seattle region and nationally. More details on the business plan can be found here. While I might wish for more innovation on the design side of the store, the mission of the store is solid, and successful. If enacted by local or county governments, a new California law promises to ease the financial impacts of urban real estate values on agriculture projects. Assembly Bill 551 offers reductions on real estate taxes to landowners who dedicate their urban sites to agriculture for a minimum of five years. Such tax incentives are common, both in California and other states, on rural and suburban lands but the urban law is a first. 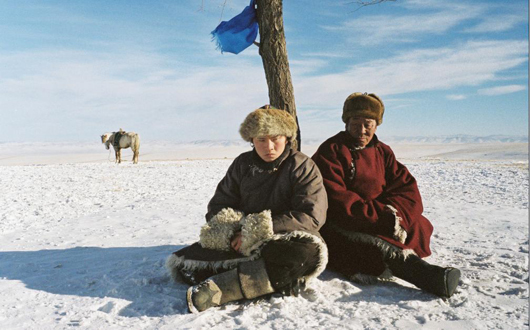 In both rural and urban areas, access to land is one of the most pressing issues in farming, as rising land values for commercial or residential development often make agricultural uses non feasible, barring land grants, subsidies or tax incentives. Read more about the law and some of the farms it impacts in the LA Times or on one of the sponsor's sites (SPUR). 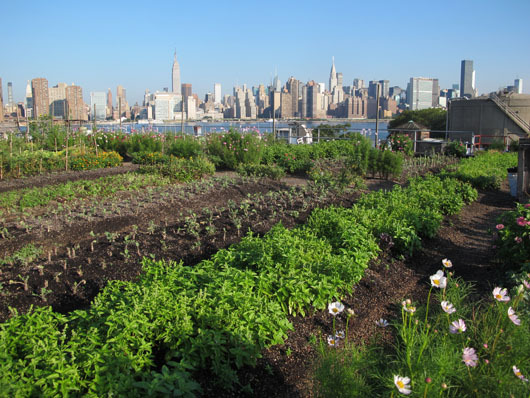 Rooftops are one of the major underutilized spaces in cities and for this reason have long been targeted for greening efforts, from plazas and ornamental roof gardens of the early 1970s to today's rooftop farms and edible gardens. 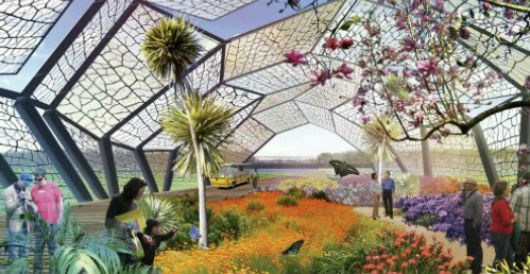 In this post I've highlighted a few of the technologies related to rooftop farming, and some case study farms that represent a spectrum of ways to incorporate farms on roofs, from technology to programming. This is only a small sample of all the urban rooftop farms out there - if you think I missed an important one, please shout it out in the comments! If you're planning or designing a roof garden (edible or otherwise) an excellent resource is Roof Gardens: History, Design and Construction by Theodore Osmundson. For very small projects (think garden shed) Small Green Roofs by Nigel Dunnett is a handy resource. 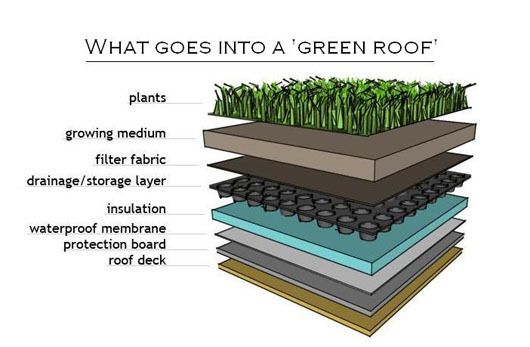 Soil-based roof gardens are classified as either extensive or intensive. Extensive gardens have very shallow soil profiles (2" or less) and can only support small, shallow-rooting plants like succulents. 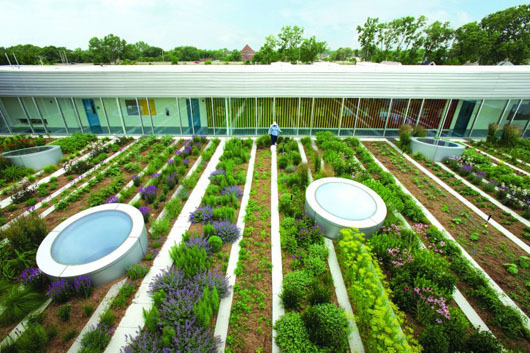 Extensive roof gardens mitigate urban heat effects and slow and store stormwater runoffs, but cannot support larger vegetation. Intensive gardens have deeper soil profiles, sometimes to several feet depending on the structural capabilities of the building and the plant material desired. 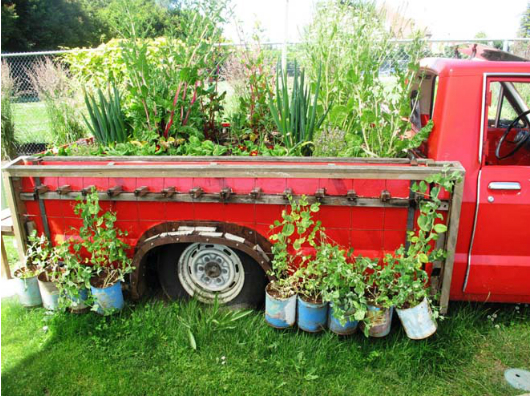 Intensive gardens can support edible plants, shrubs and even trees depending on how they are designed. 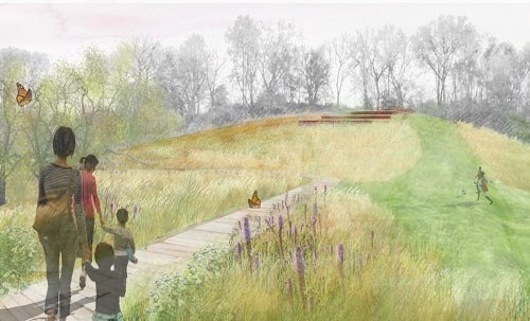 Sometimes these two are differentiated as greenroofs (extensive) and roof gardens (extensive). Planted roof systems typically consist of a number of layers designed to protect the roof itself from water intrusion, and vary most in the design of the growing medium, which must be both lightweight and able to hold water effectively. 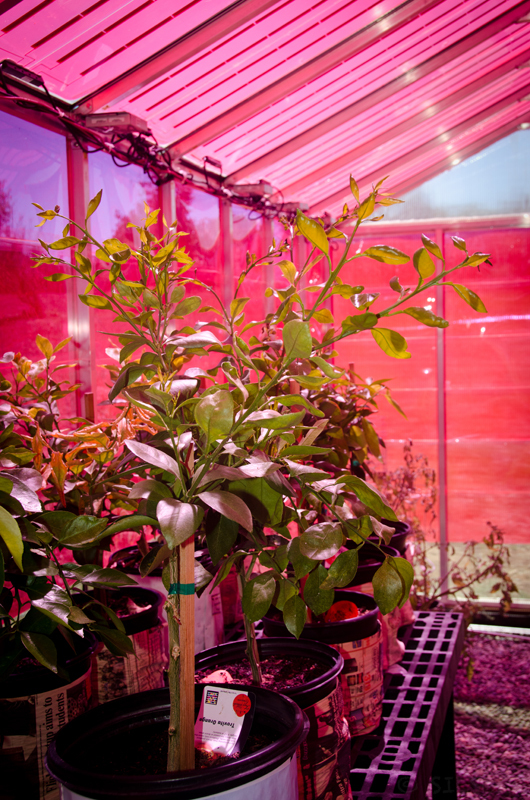 Rapid water loss to evaporation is one of the major challenges to roof garden plants. 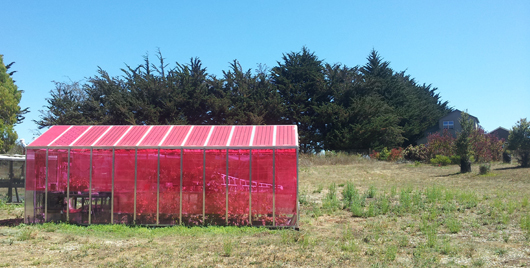 Other options for roof-gardens include planter boxes, hydroponic systems, and greenhouses. Eagle Street Rooftop Farm, in Brooklyn, NY converted their entire 6000 sf warehouse roof into farmland, by installing an extensive rooftop garden wall-to-wall. 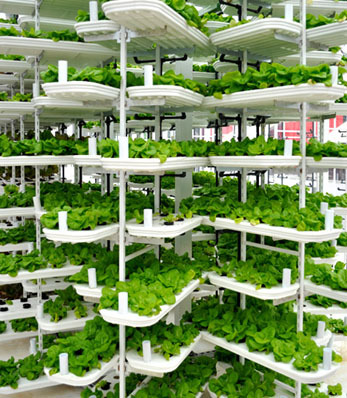 Crops are grown in beds of soil 4-7" deep, and sold in an on-site market and to local restaurants. The farm also runs education programs and is open to the public daily. 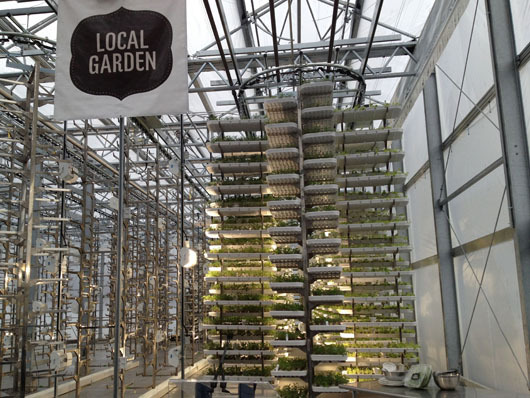 Brooklyn Grange is a successful 2-acre commercial farm using an extensive roof garden design, also in NY. Both these farms embody the most traditional aesthetic of 'farm', as if a little piece of Kansas had been blown onto a Brooklyn rooftop.